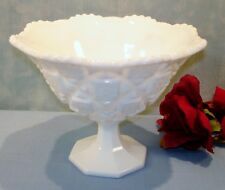 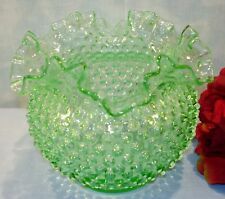 Vintage Green Glass Hobnail Large Ruffled Bowl 6 1/2"
Anchor Hocking Early Lace Edge White Milk Glass Plate 8 1/2"
Anchor Hocking Fire King Golden/22K Anniversary Swirl Dinner Plates 9"
Adam by Jeannette Pink Depression Glass Flanged Vegetable Bowl 8"
Imperial Candlewick Crystal Elegant Glassware Divided Relish Dish 6 1/2 in. 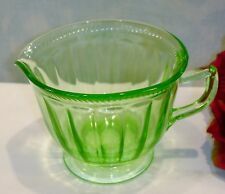 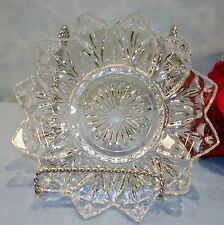 Hazel Atlas Ribbon Green Depression Glass Luncheon Plate 8 in. 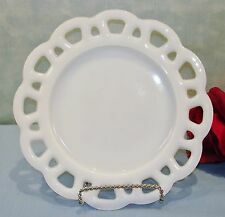 Anchor Hocking Lace Edge White Milk Glass Bowl 9 1/2"
Anchor Hocking Fire King Golden/22K Anniversary Swirl Luncheon Plates 7 3/4"
Westmoreland Paneled Grape White Milk Glass Candlesticks, 4"
Anchor Hocking Fire King Golden/22K Anniversary Swirl Hand Painted Plate 7 3/4"
Hazel Atlas Ovide Tan Dinner Plate 9"
Anchor Hocking Moonstone Divided 3 Part Relish Dish, 6 1/2"
Jeannette Adam Pink Depression Glass Pitcher, 8 in., 32 oz. 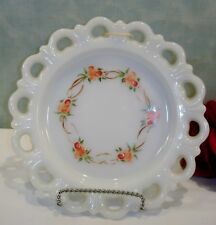 Anchor Hocking Fire King Wheat Dinner Plate 10"